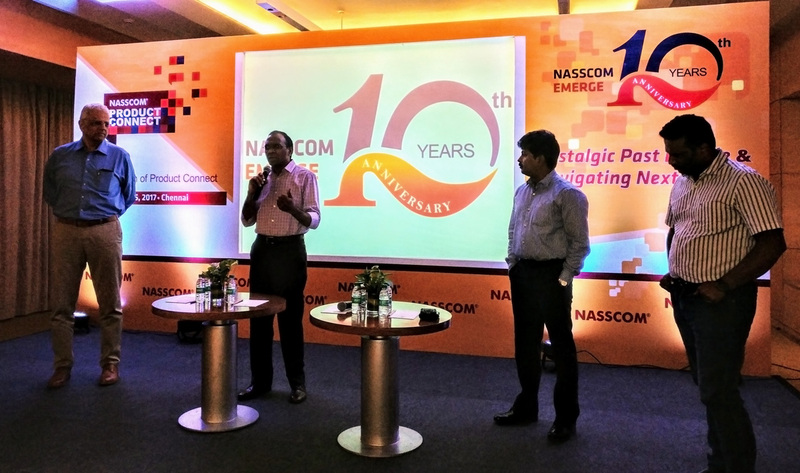 Today, Nasscom Tamil Nadu Region celebrated the tenth anniversary of its Emerge forum with a special program. It was also the 98th episode of Product Connect – a program where industry experts share their journey with fellow members of the community. 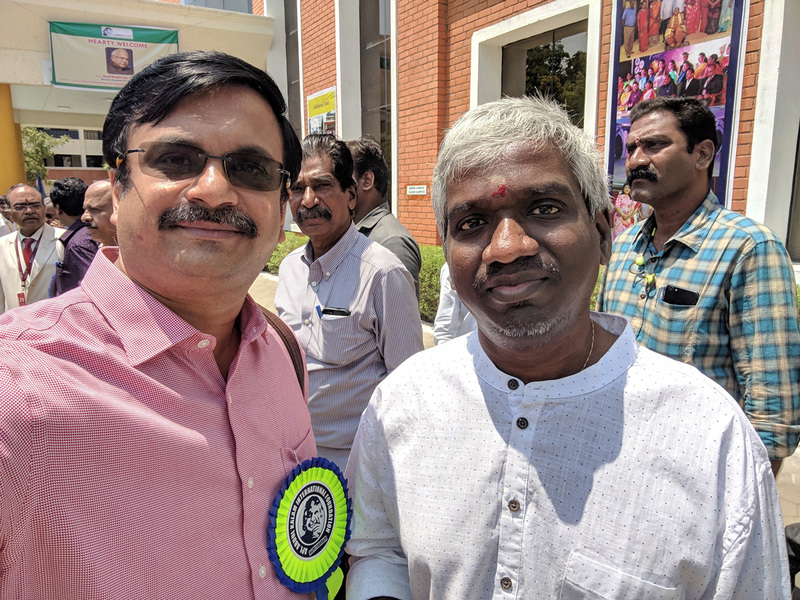 It was special program today because Nasscom had invited the same 3 business leaders of Chennai who had spoken in the very first program of Product Connect – Gowri Shankar Subramanian (Co-Founder & CEO of Aspire Systems), Murugavel Janakiraman (Founder & MD of Matrimony.com Limited) and Suresh Sambandam (Founder & CEO of OrangeScape). I was looking forward to today’s program was special for me, as I know all the three well and they know me too :-). 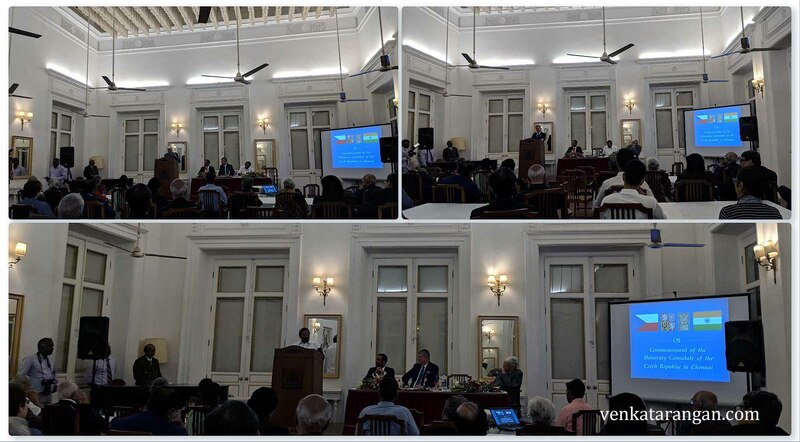 Today’s session was moderated by Balaraman Jayaraman (Co-Founder & President, Congruent Solutions Pvt. Ltd.). I have written (paraphrased) below few key points from what was being spoken. To start and run a successful product company, you need a passionate heart accompanied by a rational mind. For all the talk of slow-down with Industries in Tamil Nadu due to the prevailing political scenario, the data for Software companies is more than promising, it is doing great – a total of $17 Billion in revenue (mostly exports) with a share of $1 Billion coming from Products Business. Running a business is tough, getting through global depression is even tougher. The three business leaders (Gowri, Suresh & Muruga) have not only survived but thrived, and that’s phenomenal. 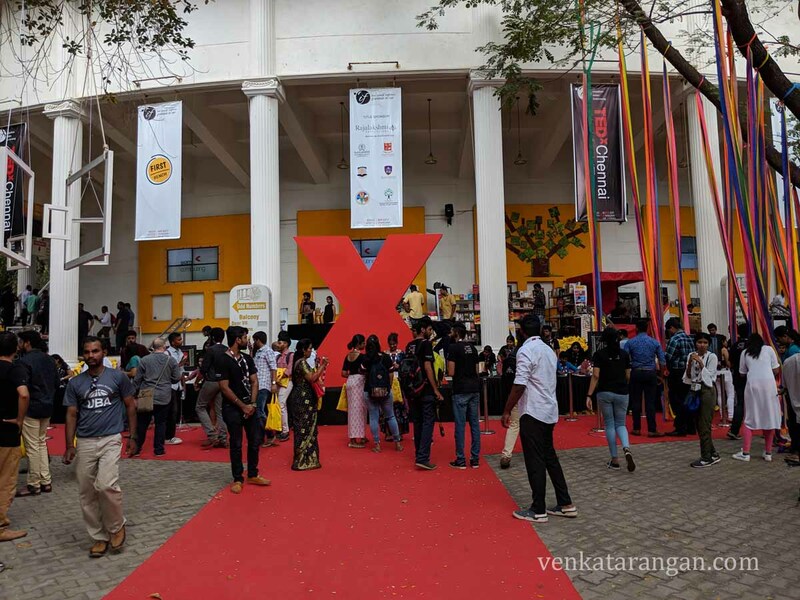 The scenario in Tamil Nadu with funding is also different – here in most pitch sessions, the founders for 80% of the time ask for advice from the other side and not “money”. In March 2008 revenues were $8 Million, today it is $68 Million. Then the employee count was 380 (offshore) and 15 (onsite), in Sep 2017 it is 2200 (Offshore) and 250 (onsite). Last 7 years, the rate of growth has been 24% CAGR. What worked for them well: 1) Able to interact with customers and employees, 2) Being out of office brings fresh perspectives, 3) Stay focused on implementing a maximum of 2-3 things at a time, Let other issues if they are important will bubble up, 4) Take calculated risks. What Gowri felt they could have done differently: 1) Focus a lot more on sales and marketing process, 2) Really (and fully) implement the decided Strategy, bet on it aggressively, 3) Could have got external funding, which would’ve accelerated growth. General views by Gowri: Today many founders sell too early, they forget the power of compounding. For Aspire Systems it took 12+ years to get the first ten million dollars in revenue, took only 2 years to get the next ten million dollars; so the hard work is in the initial phase. Lastly, money cannot be the driving factor for doing a startup. Gowri feels HR is one of their core competency. Their interview process consists of Two rounds of testing + Three rounds of interview. General hiring ratio is 1 to 100 when it comes to campus placements. Candidates are asked them to write code, it is a fundamental requirement. The whole hiring process in Aspire is quite intense. After which there is a phase of rigorous training called impact training, each associate is paired with a mentor – one to one, the objective is to make associates write code in the training phase too, it is just not classroom training. It was a roller-coaster ride for them, with three distinct phases in their business – Phase 1: DimensioN, Phase 2: Visual PaaS & Phase 3: Kissflow. Every phase lasted for about 4 years. Phase 1 – He was Enthusiastic, an Amateur, and fully with Bliss. Knew only Technology. Absolutely didn’t know anything about marketing. But had the confidence that he can sell what he built. The first deal they got was from Rane, Chennai for Rs.11 Lakhs (then $25K) after he showed they can automate an HR form in few hours. Then followed sales from Unilever, Fullerton but mostly it was only India. It was a platform they had built and as a result, they suffered from First mover disadvantage. They had to educate, and in effect create the category. It was always a struggle for cash and to make ends meet. Phase 2 – In this, they got the positioning correctly. Platform as a Service was their offering. They didn’t need to educate as everyone around was taking PaaS. 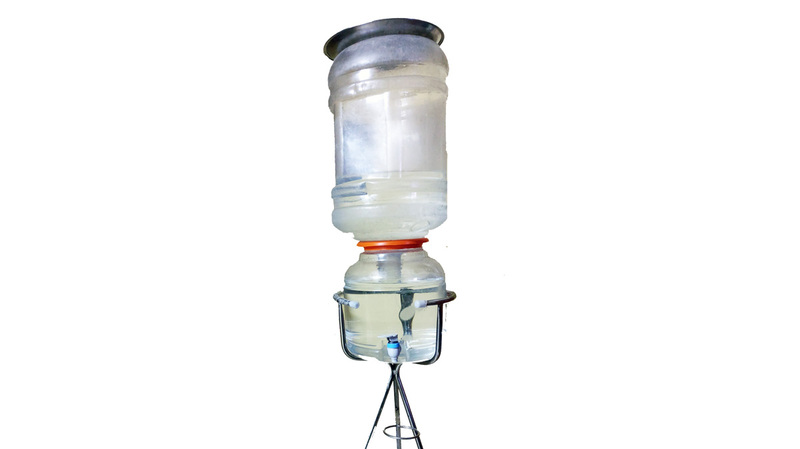 They raised $1million funding, made it to global top ten in Gartner, Forester lists. Unfortunately, within few years, Google which had championed PaaS, was struggling with it – the PaaS market evaporated. The OEM deal they had been working with Google fell through. Suresh‘s co-founder left the company, Investors became anxious, all the money that was raised had been spent, the company was very close to shutting down – luckily, core team didn’t leave and stayed put. Phase 3 – By now, they have learned that “Marketing” was everything. “Sales” was a process and it is not about individual people. Orangescape got all 3 right – category, product, timing. Invested and came up with a world-class user experience (UX). Acquired 10,000 Customers, across 120+ Countries, and about 10-12% are paying customers. They have about 100+ Employees and most important “Profitable”. No VC funding after their initial $1 Million funding. In G2Crowd Reviews, KissFlow ranked the top with 94% rating, trailed by Bpmonline and then Zoho Creator. In KissFlow, they do inbound marketing. Their sales are through customers discovering them through Search and other mediums – they then come to their website, try their product and then buy it. General observations by Suresh: It is not software is eating the world, it has to be said SaaSis eating the world. Today over 10,000 people in Chennai are working in SaaS Products, $1billion of revenue is made. There are many successful SaaS companies in Chennai – including Fresh desk, Zoho, ChargeBee & Kissflow. Chennai is the SaaS capital in India. 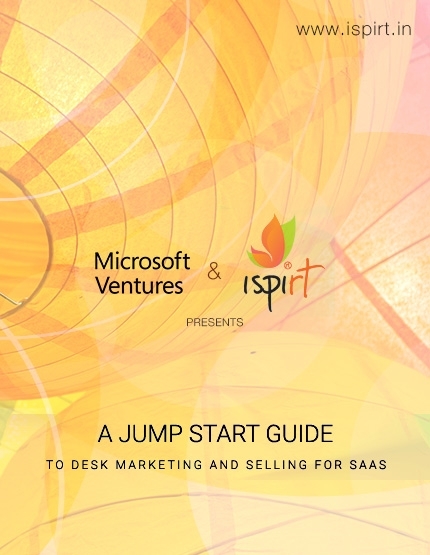 Those interested in how to do marketing for SaaS can check this free guide – Desk selling and marketing – A jump start guide – To desk marketing and selling for SaaS. As a thumb-rule, you need the equivalent of 12-18 months of your expected revenue available as your marketing spend. In FY07 they were doing Rs.16 Crore in revenue, today their revenues are over Rs.292 Crores annually. Chinese Internet companies are today worth tens of billions, Indian companies have similar or better growth in front of them. Ten years ago in India Matrimony.com didn’t have a mobile app of their own, today 80% of their traffic comes from their app. Two significant changes happened to them in their journey. 1) In the first one they were doing Non-core expansion – into portals for Automobiles, Loans, Classifieds and Properties (which got spun-off successfully later); that strategy didn’t work, global economic slowdown happened in 2008, then suddenly funding was not available. They looked at every cost in their business after the recession, then within six months returned to profitability. Today there is so much of funding available in India, but they had raised only Rs.99 Crores in the first ten years. 2) In the second one, they focused only on their core (matrimony/wedding) industry. Wedding Industry is a $54 Billion per annum in size. For every match-making, they make only Rs.10,000, but in a typical Indian wedding, Rs.8Lakhs is being spent. Their strategy is how to get a larger pie of this spent. They have started with Matrimony photograph service three years back, now they are doing over 400 events every month across South India. They are now experimenting in Tamil Nadu with Matrimony Bazaar, which is an assisted e-commerce service and there is Matrimony Mandaps. For social media marketing ten years before they were spending over 50% of their revenue, today it is less than 3% of their revenue. They were technology services that got started in 2001. Due to a dispute with their principal client they had to go to a settlement. Luckily, due to the settlement, they managed to come out of a non-compete clause, which presented them an opportunity to enter an industry they had worked for the client. Recently they launched CoreDC (COngruent REtirement for Defined Contribution) a product for Retirement Plan Providers and recordkeepers in the US. The industry they operate on is a mature one. Most of the players in this are using 25 years old technology, that’s both an entry barrier and opportunity. Congruent had to do a lot of work to be seen visible in the industry. Now their product CoreDC is available in SaaS model. You need to remember that “the person in your client company who is making the decision to purchase your product is the one actually taking the risk. This risk could be more than you developing your product or starting your company”.